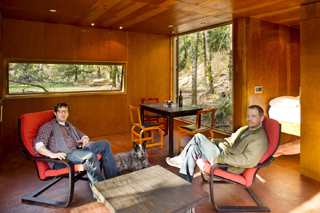 Joel Egan, Robert Humble and dog Tucker sit in the Enumclaw retreat HyBrid built to promote their “cargotecture” designs using cargo containers. HyBrid Architecture's compact, modular visions are going places. Construction is scheduled to begin next month in Houston on a HyBrid project that will serve as a prototype for compact sustainability across the Gulf Coast. HyBrid also worked on the design team that created the modular apartment cube “Inhabit,” planned for projects in Seattle and Portland, and the firm's designs for train cars turned living spaces have landed them in Vanity Fair and Metropolis and on HGTV.